Good general rain today. Most welcome for water tanks and give the pasture a drink. All last night it rained gently and steadily and looks like it will rain all day. Fantastic – this is the first wet weather since cyclone Debbie and things were starting to dry out. Moist soil may delay the start of what is promising to be a cold winter. Moist soil is also good for the BD500 application at the end of the month. Before the rain, day temperatures were in the mid-twenties and nights in the mid-teens. Beautiful growing conditions; warm days and cool nights make happy plants. Recently retuning to stock White Sage, Betony, Chickweed, Saffron, Alehoof, Yarrow, Sweet Violet, Mugwort and Baical Skullcap. Looking particularly good are Tansy, Lyre Leaf Sage, Chickweed, Incense Grass and Burdock. Next month should see the return of Juniper (self-fertile), Tea and Wasabi. In spring, all things being equal, we should see the return of Sea Buckthorn, Star Anise and Cinnamon. Will post progress photos on Facebook. Good germination conditions prevail. There is a nice fluctuation between day and night temperatures and the moisture in the air is close to the earth. Watering schedule is being closely monitored to prevent potential over wetting of seed trays. Recently sown include Woad, Salad Rocket, Weld, Red Clover, Continental Parsley and Radium Weed. Particularly good germination of Watercress, Clary Sage, Hyssop and Chervil from a previous sowing. Returning to stock include Woodruff, Eyebright, Monkshood, Hop, Borage, Indigo and Siberian Ginseng. New to stock is Sagebrush – this American desert native has a shared smudging tradition with White Sage. These terms refer to the life span of a plant. An annual germinates, grows, flowers and produces seed in one growing season. A bi-annual produce a strong root system in the first growing season and flowers in the second season. A tri-annual flowers in the third season. A perennial is described as living for an extended period of time and flowers every season after it achieves maturity. In many cases this description is not fixed. The performance of a plant can vary, depending on the climate. 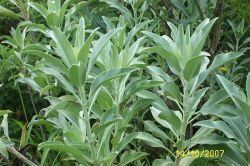 A plant from a cool climate, when grown in a warm climate may become bi-annual or even perennial. Conversely, a warm climate perennial grown in a cool climate may perform as an annual or bi-annual. The point for plant growers is that this description of a plant is allocated in its native climate and, when, grown in a different climate, the performance of a plant may change. Plant and seed specials for May were posted separately last week. Marigold and Coltsfoot have currently sold out, and more plants should be ready at the end of next week. Use WAIT LIST function for email notification when in stock. ● incense Grass plant, cool climate species, heavenly aroma.